Red meat is one of those topics, in addition to being a food, that never ceases to cause plenty of controversy. Depending on who you ask and when, you'll be likely to hear a different story and a different opinion on the matter, particularly whether or not it is healthy to consume. This week alone, two influential groups have offered two opposing opinions on the role that red meat should play in our diet, if at all. In one corner, we have researchers from the Harvard School of Public Health releasing a paper reaffirming the longstanding notion that red meat is deadly. In the other corner, we have the American Meat Institute Foundation positing that red meat is an important component in our diets and that it is perfectly healthy in moderation. In the paper released this week in the American Journal of Clinical Nutrition, the researchers argue that diets high in red meat are associated with a 51% increased risk of developing type 2 diabetes. They went on to clarify that just one 100g serving of red meat per day raises one's risk by 19% and a 50g serving of processed red meat per day raises it by 51%. 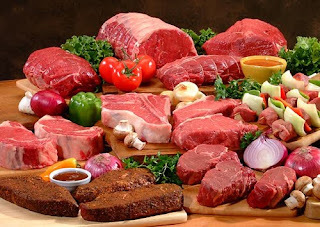 This amount of red meat in total per week exceeds the dietary recommendations of most countries, even the U.S.
Part of the reason behind the results of that study are the facts that red meat tends to be high in saturated fats and that high-calorie meat-rich diets can both lead to obesity, the main risk factor for type 2 diabetes. However, representatives from the American Meat Institute Foundation correctly pointed out that no single food should be blamed for 'causing' diabetes or obesity, and that a body of evidence should be considered, rather than the latest 'hot' study to come out, when weighing the facts about a food's role in our diet. In reality, both groups, pro- and anti-red meat, are supported by evidence that makes them correct to some extent. Red meat, particularly if it is lean, is a great source of protein and it is also iron-rich. Many people, especially women, struggle to consume enough protein and iron each day. Iron is an essential component of our red blood cells that carries oxygen throughout our bodies. If you're low in iron, you're going to feel tired, sluggish and short of breath for no apparent reason. Protein is essential for maintaining a strong immune system, healthy muscles and a good metabolism. So once again, the 'correct' answer here is neither avoidance nor indulgence. If we meet somewhere half-way and follow our food guide, we will find that moderation is once again the word of the day and that a little bit of red meat goes a long way!